Demonstrate the implementation of a system for publishing and discovering MASAI services, relying on an existing open source Search Engine: apis.io. Demonstrate the feasibility of a decentralized system for publishing and discovering MASAI services, relying on standard/market Search Engines and compliant with standard vocabularies used to ensure SEO – Search Engine Optimization. Demonstrate how an existing mobile app can be used as a Concierge integrating with the MASAI SD and SP API’s. This PoC also shows how a Concierge can take advantage of the several integration modes foreseen in MASAI, for instance integrating with AirBnB through deep link, passing the location as a parameter to the AirBnB app. Explore and demonstrate the potential of WIT.ai in terms of translation from natural language to structured data and the capabilities for integrating with external systems, like MASAI SD and SP API’s for building Chat Bot Concierges using Facebook Messenger. Explore and demonstrate the different types of UI templates (so called chat cards) made available on MS bot framework v3, for different chat app clients (e.g. Skype and Facebook Messenger) and evaluate how they can be used and match the MASAI requirements in terms of the UI interactions with the traveller for discovering and booking MASAI services (e.g. taxi). Demonstrate that MS bot framework v3 can be used for building UI sophisticated Chat Bot Concierges compatible with the most popular chat apps like Skype and Facebook Messenger. The MASAI Chat Card SDK is used for the generation of the chat cards. This PoC also takes advantage of the MS semantic bot for translating the natural language (i.e. traveller requests) into structured data (i.e. used to feed the MASAI Service Discovery and SP API’s) required during the interactions with the traveller for discovering, planning and booking the MASAI services (e.g. taxi). 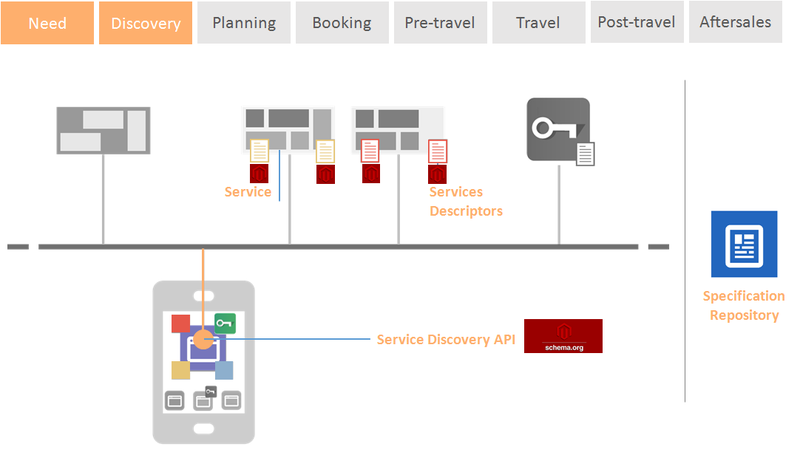 Demonstrate how a Concierge integrating with the MASAI SD and SP API’s, can build a dynamic UI using the content of the SP API descriptor provided by the MASAI Service Discovery. This PoC also integrates with the Folder prototype developed (v0). 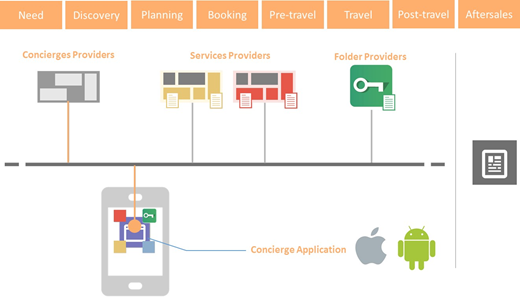 Demonstrate an end to end mobile Concierge (Android and iOS) integrating with a secured Folder (using OAUTH2), the MASAI SD and a taxi SP API. Demonstrate a Concierge in the field using the MASAI SD and SP API’s to get information about bus services, routes and stops. This PoC also demonstrates how MASAI can integrate with existing API marketplaces, being that one of the bus API used is published in Mashape marketplace, to benefit of the usage control (including monetization) and analytics provided by the marketplace. This POC demonstrates the retrieval of personal data from a user with an account at non MASAI aware folder service providers by the concierge using OAuth 2.0. The data owner stays in control. The data owner decides if the concierge gets access to the data at his non MASAI aware folder service provider. The data is not stored within the MASAI environment. MASAI only stores a token. 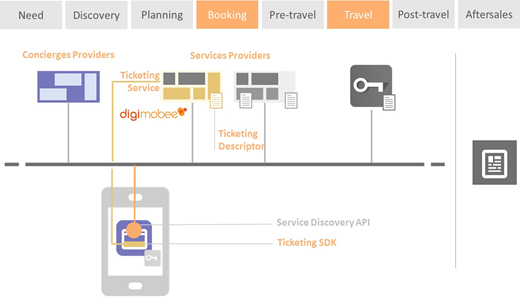 This PoC explores the possibility to propose the contactless ticketing functionalities as MASAI services for storing token / tickets in NFC smartphones. These services would complete the seamless experience of the Travellers allowing them to directly use contactless tickets with their smartphone instead of picking them up in stores or counters.